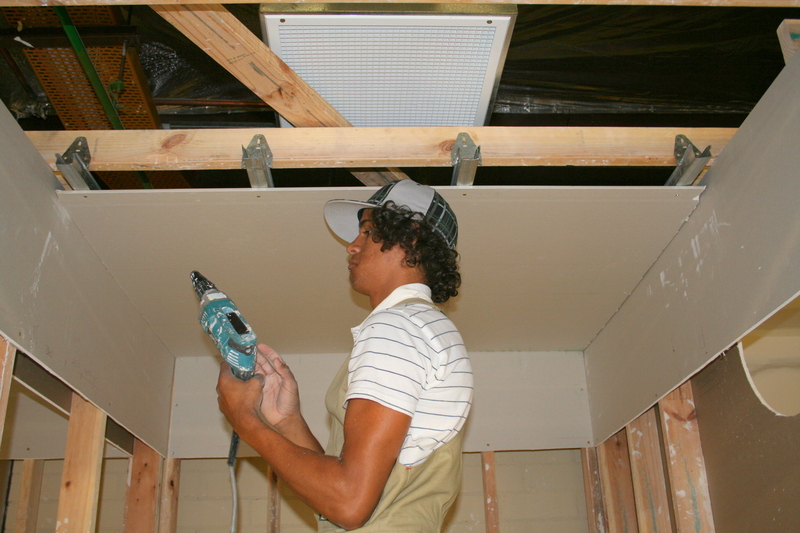 A past student installing a ceiling. The class has overall been exposed to this type of ceilings in their workplaces and constructed bulkheads using steel components. That is a good starting point and the beginning of formative assessment, to judge where they are in terms of Guild or Trade Knowledge. Basic component knowledge as usual is reasonable using trade terms for the parts but not the actual part numbers and names. Introduction to part names and numbers . Review Hanger, the components and weight ratings. Wider purlins, large ducting, light fittings and setting out to avoid conflict with Framed ceiling steels work. Discussion re: setting out and spacing hangers and introduced idea that they need to just work out the hangers and components for one run of TCR and then multiply that by the number of runs across the ceiling. Noticed that the main gap in knowledge is in the area of unsupported TCR and Furring Channel distances. Uncertainty regarding set out of furring channel in Direct fix Rondo Ceilings. NOTE* They knew the 600mm centre but has difficulty in setting out a 1500mm wide space with a 70mm centre each side. Mose wanted to include a fifth Furring Channel (should divide the remaining span by 2 and place furring channel 300mm each side of centre). Extra time needed to draw out the correct information and add more setting out examples and situations. In the work bays, plans laid out on the bench and general discussions, regarding construction. students seemed clear and began working. Difficulties with centering access panels etc. This entry was posted in CB-A, CB-A Project, CPC08, CPSISC Coop, Qualifications, tafeSA, Training, Uncategorized, Wall & Ceiling Lining and tagged Action Learning, apprentices, assessment, gilles plains, tafeSA, Wall and ceiling lining. Bookmark the permalink.